The Central Asian Anti-Plague Scientific Research Institute was established in 1949 in the suburbs of Almaty under the authority of the Main Directorate for Quarantine Infections of the USSR Ministry of Health. It was part of the Soviet system for the control of highly pathogenic diseases and operated a Central Asian network of nineteen epidemiological monitoring stations. The institute developed diagnostic tests and vaccines for several infectious diseases, including anthrax, plague, tularemia, brucellosis, cholera, and listeria. In addition to serving civilian needs, the institute was involved in military-related research and development of defensive measures against BW agents. To this end, the institute received Soviet intelligence on biological agents developed by Western militaries, including pathogenic strains modified for military purposes, and prepared vaccines and diagnostic preparations against them. The Anti-Plague Institute had no direct links with the BW research centers under the Soviet MOD, the Ministry of Agriculture, or Biopreparat, though it participated in exchanges of scientists and technical knowledge. Nevertheless, the possibility that the Anti-Plague Institute was involved in offensive BW developments cannot be ruled out. In 1992, Moscow terminated funding for the institute's research and all military-related work ceased. After the disintegration of the Soviet Union, the Anti-Plague Institute was put under the authority of the Kazakhstani Ministry of Health and renamed to M. Aikimbayev Kazakh Scientific Center of Quarantine and Zoonotic Diseases (KSCQZD). The institute became the scientific and methodological center for the eight anti-plague stations in Kazakhstan (in Aktau, Atyrau, Kyzylorda, Taldykorgan, Oral, Shymkent and Aral) as well as 15 anti-plague field stations located in the plague-endemic areas, which cover 40% of the Kazakh territory. Isolated cases of human plague occur in Kazakhstan every year. KSCQZD currently is developing diagnostic preparations and vaccines for virulent infectious diseases, conducting epidemiological monitoring, and training specialists. KSCQZD was named as one of four World Health Organization regional centers on plague for Central Asia. Although the center has experienced financial hardship since its transfer to Kazakhstani control in 1993, it has managed to obtain some foreign assistance from the International Science and Technology Center (ISTC) and European foundation. KSCQZD scientists have contributed to several research projects undertaken as part of the EU Framework Programs. Four KSCQZD researchers were involved as co-investigators in a project entitled Marmot Biodiversity Conservation in Eurasia, which ran from 1994 through 1998. Another seven scientists contributed to a six-month project under the Fourth EU Framework Program in 1999. The Fifth EU Framework Program in 2000-2003 provided funding for a project involving 23 KSCQZD researchers, who had teamed up with researchers from Kazakhstan's Institute of Mathematics to develop a mathematical activity forecasting model for natural plague foci. KSCQZD has been involved in ISTC projects since 1999. To date, the KSCQZD has completed four joint projects in conjunction with U.S. partners, worth a total of U.S. $952,967. Another three ISTC projects worth U.S. $456,110 are underway, funded by the U.S. and Canadian governments. Thanks to Canadian government funding disbursed via the ISTC, KSCQZD was able to host two research conferences in 2004, involving plague researchers from all NIS. One particular benefit of ISTC projects is that they facilitate the supply of new laboratory equipment and provide training for researchers. In 2000 and 2001, 11 KSCQZD researchers took a two-month training course in advanced laboratory research techniques at U.S. and British laboratories. With their newly acquired skills and state of the art laboratory equipment obtained from the ISTC projects, KSCQZD has now instituted methods for the molecular study and identification of suspected bioterrorism materials. The Canadian government has also supported the establishment of a Central Asian Biosecurity/Biosafety Training Center at KSCQZD. The KSCQZD personnel develops relevant reference materials and tools and uses standardized training modules and courses to provide training to regional bioscientists. 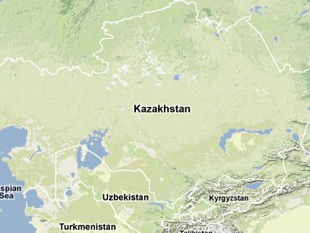 KSCQZD houses a culture collection consisting of over 2,000 highly dangerous strains of pathogens, including those that have been isolated in Kazakhstan. For instance, KSCQZD possesses 71 Bacillus anthracis strains, mostly of virulent forms, that were isolated in the previous years (1952—2004). By the government decree, the center’s culture collection has been recognized as Kazakhstan’s official collection of pathogenic bacteria. Ensuring physical security of the institute's collection requires considerable measures, and to meet this need, the CTR program provided funding for two joint projects involving KSCQZD in 2000-2002. The first supported security upgrades at the facility, while the second one provided KSCQZD with Internet access. As a result, the outer perimeter of KSCQZD was renovated: a new fence made of lightweight concrete panels and topped with razor wires was installed around the perimeter, and construction work was done on a new guard station. To improve visibility, trees and bushes were removed from the territory, and several obsolete buildings were torn down. In addition, outdoor light poles and searchlights were installed, and façade lighting for the secure buildings was mounted on the internal perimeter fence. The effort also included replacement of the entry door to the collection by a metal one with combination locks to prevent unauthorized access by personnel other than collection employees, protection of all windows with metal grids, and deployment of an electronic alarm system connected to a central control post at the guard station. A telecommunications project completed as part of the effort gave KSCQZD a computer network with Internet access via an in-house satellite antenna. A new CTR initiative consists of improving disease surveillance in Kazakhstan. After an appropriate amendment to the U.S.-Kazakhstan intergovernmental Agreement Concerning the Elimination of Infrastructure of Weapons of Mass Destruction was signed on December 8, 2004, the U.S. Department of Defense officially launched the Threat Agent Detection and Response (TADR) project in Kazakhstan. KSCQZD’s five anti-plague stations — Atyrau, Zhambyl, Manghystau, Shymkent, and Taldykorgan — began receiving new laboratory equipment from the TADR project in January 2005. As part of cooperative biological research under the U.S. Department of Defense’s Biological Weapons Proliferation Prevention Program (BWPPP), KSCQZD researchers have teamed up with researchers from the country's sanitary epidemiological system to study anthrax. The project, scheduled to run for three years, stands to receive $445,900 in funding. Jonathan B. Tucker's speech during the briefing on "Biological Decontamination of Vozrozhdeniye Island: The US-Uzbek Agreement." BW Materials Security and Transparency, Cooperative Threat Reduction (CTR) webpage at the Defense Threat Reduction Agency (DTRA), www.dtra.mil. Yevgeniy Troitskiy, "Fizicheskaya zashita, uchet i kontrol biomaterialov v NISKhI MON RK," Problemy Nerasprastraneniya, Special Edition, April 2001. Alevtina Izvekova, "International Assistance for Anti-plague Facilities in the Former Soviet Union to Prevent Proliferation of Biological Weapons," Issue Brief, Center for Nonproliferation Studies, June 2005, Nuclear Threat Initiative, www.nti.org. Lukhnova L., Temiraliyeva G., Meka-Mechenko T., Pazylov Y., Zakaryan S., Denissov J., "Microbiological characteristics of anthrax strains," Abstract number: 1134_02_390, 15th European Congress of Clinical Microbiology and Infectious Diseases, European Society of Clinical Microbiology and Infectious Diseases, www.blackwellpublishing.com.